Volume 2 update, Crow Koma 2, concept art! It's been an extremely busy few months. Enhancing the art was a great idea at the start, but it has come with it's own challenges. Not only do I have to redraw some pages and frames, but I failed to realize that it also meant applying completely new tones to the art to fit the newly drawn panels! Yeah seems pretty obvious right? The reality of how much work that is for one person begins to sink in after a bit! I've now recruited some close friends to help me finish off the rest of the work so we can finally get this book out! Next week I'm going to post the cover for volume 2, along with a brief description of the story. So along with working hard on finishing the book and new scenes, I've also been attending a lot of conventions. In fact, 3 conventions in 4 months! Taiyoucon and Con Nichiwa in Arizona and Sabaku Con in New Mexico. It's been a great pleasure meeting all of the new faces and getting a chance to talk about my book! I even did a panel about my experience with publishing and self publishing, and it turned out amazing! There are two reasons why I am doing conventions when I have a book to finish. First of all, I want to get volume 1 out to as many people as possible in preparation for volume 2. It's thanks to you all that I have this chance, and I want to make sure I take full advantage of spreading the word so volume 2 can be a success for all of us and we can hopefully go with a volume 3 and more! And the second reason is, well, to pay bills! I've been doing conventions in order to take care of expenses, and that has thankfully allowed me to give the second volume all of the love and care it deserves. I'm just thankful that I've been able to make enough money from conventions to do so. Thank you to everyone who's come by my table to buy something, and also thank you fans for believing in me in the first place. Without your help and support, I would have never thought that I could get out there and make money at conventions. I've had a surprising amount of people mention cosplaying my characters. Some have even asked me for permission. I just wanted to say now...YES PLEASE DO!!!! I don't deserve it, and I'm really thankful that some of you enjoy my characters enough to cosplay! If you do ever cosplay my characters, please send me pictures! I will gladly share them with the rest of the Orange Crows community so you can show off your hard work! I have no idea why someone wouldn't want their characters cosplayed, but to each his own. I for one welcome it and I'm honored to hear such a thing! Also, I'm more than happy to provide references as well. 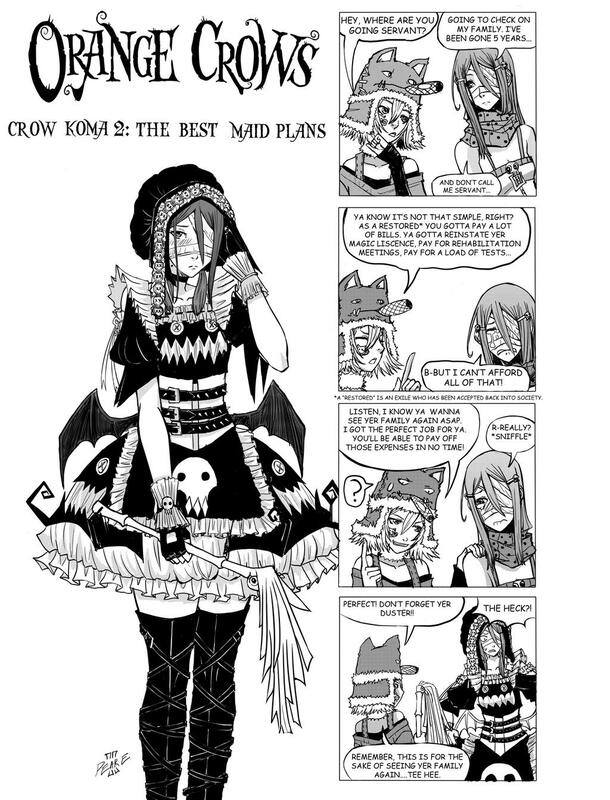 If you ever need a reference of an outfit that you'd like to cosplay from Orange Crows, please send me a note on deviantart or e-mail me at jamesperryii@yahoo.com and I'll be more than happy to draw some for you! I also wanted to share some of the behind the scenes work on the book for those of you who weren't part of the Kickstarter! This week, I have my concept artwork for Lain, the reclusive witch who speaks with snails. Follow the link and see some of my thoughts while I was designing the character. I hope you enjoy the concepts, and I'll have some more for you next week!